This topic has 0 replies, 0 voices, and was last updated 2 weeks, 6 days ago by Brett Warthen. Please put aside any preconceived thoughts on guns…whether you are pro “gun rights” or pro “gun control”, David Smith’s Parkinson’s Disease “gun therapy”is one of the most intriguing and inspirational PD stories of recent weeks. Diagnosed with Parkinson’s 8 years ago, David found nothing that would help with his tremors. He had always enjoyed shooting at the gun range, and would shoot at least every other week, sometimes more frequently. He realized that the activity was calming for his tremors, so he decided to do it more frequently. 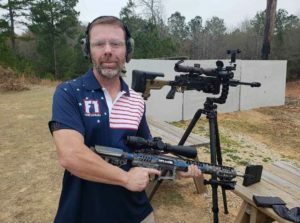 Now, he is in the big leagues…a professional shooter who has been chosen to be on the US team at the IPSC Rifle World Championship in Sweden this fall. The first two years were the worst. The doctors were trying to medicate me so I wouldn’t shake. They had me on all these pills — five different types, 25 a day. He tried boxing and cycling programs, but nothing seemed to help with his tremors. He had always enjoyed shooting at the range, and would shoot at least every other week, sometimes more frequently. He realized that the activity was calming for his tremors, so he decided to do it more frequently. I started doing it seven days a week, along with some agility training and movement exercises. I was just able to move freely. Kind of like dancing with a partner. Every time I threw the gun up, I was able to move and not short-step, you know shuffle my feet. Basically, it was just a matter of doing more of that. From there, I got into shooting competitions. Now, he has been chosen to be on the US team at the IPSC Rifle World Championship in Sweden this fall. When I read the email (for the World Rifle Shoot), I read it like 20 times. Then I called USPSA to make sure. It’s the biggest deal of my life and something I never really expected. At six or seven, I dreamed about winning the gold in the Olympics. When I got sick with Parkinson’s, all that went away. So now, this is like a step above that. I look at all the names of people going, all my team members, and I’m blown away that I am actually shooting with them. David is an inspiring example of people challenging their Parkinson’s Disease diagnosis by engaging in physical activity that they enjoy. We’ll be looking forward to hearing more about David in August during the IPSC Rifle World Championship.